Make your special day extra memorable with these unique wedding invitations. 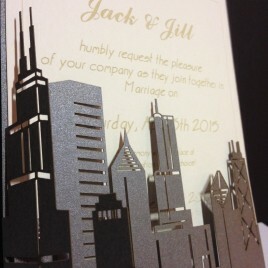 Laser cut gate with the Chicago skyline and engraved 140# watercolor paper invitation inside. Intricate cutouts of iconic buildings gently enclose your special notice. Fully customizable with your chosen font, wording and gate color. Additional alterations available upon request.